The majority of people use a pencil to draw hairs. Wrong! A pencil line very rarely describes a hair. When you look at an animal, or human, what do you see? Hairs? No you don't. You see the SHADOWS BETWEEN THE HAIRS. Those shadows - the dark gaps between the hairs - define both sides of each hair, or lock of hair. 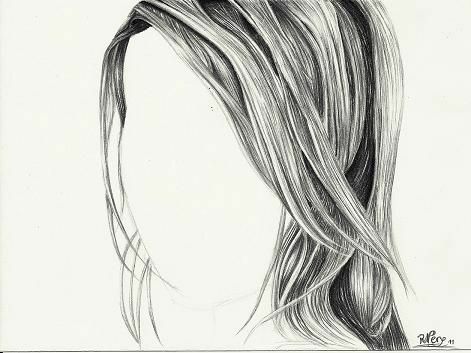 Barring the bang of hair traversing the forehead, I rendered the hair with super-sharp HB and 2H pencils. I sharpen at least a dozen of each � they dull quickly and dull pencils lead to dull, life-less hair.